Please login to ensure the most complete experience possible. To access the forums, click the 'Home' Link on the navigation bar up top. The homepage is the 'Portal' that the website defaults to. This is a Playstation, sim-style community. Cheap, lobby-style tactics are not tolerated. Once logged in, you will have access to all sub forums hidden from guests, as well as images and links. Let us know if you have any questions. 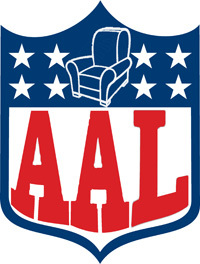 Welcome to the American Armchair League of America. This is the ninth installment of our Online Franchise. We are always looking to add quality members to the league to take over a team and be active participants. If we're full, we'd be happy to maintain a waitlist should a position open up. This is a sim styled league in that we discourage lobby antics and want to play against other users who like to have fun and build their team in a way that reflects the real NFL. Sound like fun? Follow the three steps below. If you haven't created an account yet, I highly recommend you use your PSN ID as your login. Just so it's easier on us to identify who you are. Please copy and paste this into a reply post. Twitch ID/YouTube: If you don't have one, create one. Make sure to sync it with your PS4 to broadcast games. [You must be registered and logged in to see this link.] You must set your twitch up to archive all your stream footage automatically. Here is a [You must be registered and logged in to see this link.] if you need help. Why you? : What can you offer the league? We have a solid veteran group. What do you offer the league to keep things fresh? We're not looking for people here to just play games and be their third, fourth, or fifth league. We need committed users who want to be active. Read and understand the rules. Let us know of any questions asap. You must post afterwards that you agree to abide by them. Rules are TBD. You must play a tryout game before gaining a franchise invite. You will play versus myself, GoingCommandoAZ, King_Hippo72, or another user that I use as a proxy. You can create a group message in discord/PSN with the three of us, and we will work out a time to play with you. You must stream your tryout via twitch/YouTube, and also have archives of your streams backup to twitch/YouTube automatically. Here is a [You must be registered and logged in to see this link.] if you need help. You can set your avatar to whatever you want. I recommend one that represents your team, but it's not required. If you don't replace the default avatar, I'll set one for you that matches your team. Why Me? : Younger guy been playing madden since i was 16. I have always played sim style football never lobby. This will be my only league, therefore i will be invested. Great football knowledge, laid back social guy. Why Me? : I've been playing madden since I can remember. Once franchise mode was created it was always my go to. Im a fan of sim style play, dislike game exploits and cheese plays. I'm in one other sim league on discord, and I'm super active, check discord probably too often. Why you? : I'm decent at madden. I run a realistic scheme with zero cheese or money plays. I'm active and play all year. I follow all the rules. FREE 50$ & PUPILS JUST SIGN UP HERE! Sign of the Sun - need help, please?